All DRW products are guaranteed against manufacturing defects for 2 years from receipt of goods to the original owner, all parts (except listed items below) are covered during this period and any labour costs. 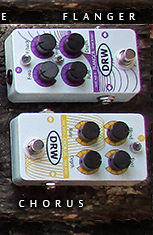 You do not need to register your pedal, keeping the original sales receipt will suffice. ● broken knobs and pots due to misuse. 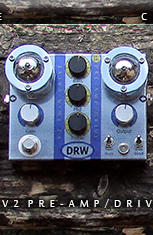 ● if you have modified your pedal in any way from the original specification. ● and of course batteries are not covered by our warranty. Postage and shipping costs to and from DRW are the responsibility of the owner. Please contact us first if you have any issues, and if you need to return your item once evaluated, we will send you a Returns form via email for you to complete and return with the goods, hopefully a very simple process, we will keep you updated with the progress of your product repair once it has been received back at DRW.